The stringing together of similarity, moments coincide, patterns present themselves to the guillotine, the chopping block, on judgement day. They seem to say, “but we are one and the same”. 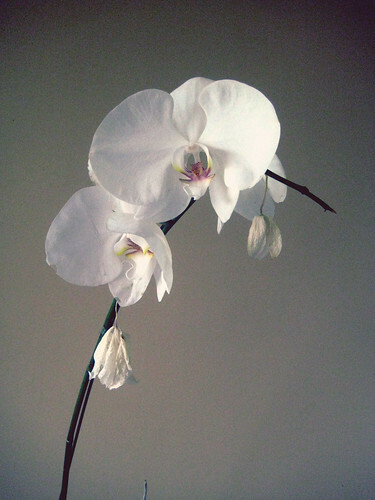 After watching Adaptation the other day, with all its musings on orchids and adaptation and the like, I was a little taken aback to find, there in my inbox, an email requesting permission to adapt a photo of an orchid that I’d taken some time back. They wanted to use it for a Mother’s Day greeting card. Times as these seem to raise themselves above the mundane somehow, into prominence, into significant somethings. They hang there in the air, in the mind and can, at times, prop up curious wonderings of an otherworldly guidance. It is as though echoes and reverberations in the mind are being bolstered by some similar perceived event, and these soundwaves are amplified by degrees depending on how closely the events resonate with each other. Sometimes it seems for the most part, we pay attention only to the loud, bellowing shouts of high coincidence, while the more subtle sounds resounding under their breath often go by unnoticed. Perceive patterns, the coinciding of all things. Here is a flower. This entry was posted on Tuesday, May 5th, 2009 at 9:55 pm	and is filed under Blog. You can follow any responses to this entry through the RSS 2.0 feed. You can leave a response, or trackback from your own site. This was an elegantly composed entry, and I love the photograph. Perhaps I will check out ‘Adaptation’; in any case, kudos for sharing your thoughts. I really love flower photographs and i enjoyed reading your post. phocks is evolved by WordPress 3.5, adapted by Darwin theme. Entries (RSS) and Comments (RSS). Valid CSS & XHTML.